Emma Bennett’s hauntingly beautiful paintings contemplate space, time and the fragility of the human condition. 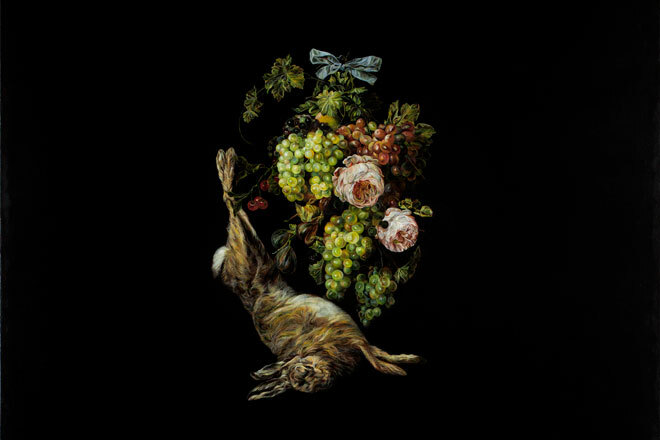 Appropriating imagery from historical Dutch and Italian painting, Bennett immaculately renders bowls of ripened fruit, bouquets of blooming flowers, dead game and swathes of rich fabric that reflect this long tradition of still life painting – of apparent naturalism underpinned by compositional artifice, and of time suspended. Emerging out of the midnight–black void of her canvas, the subjects allude to the transitory nature of existence; to life, death and the after-life. In her latest work, Bennett considers the ephemerality of imagery, memory and the desire to make these moments more permanent, and references the investigations of historic and contemporary still-life photographers – from Roger Fenton to Wolfgang Tillmans. Bennett illuminates the tradition’s darker side – through the use of allegory and in reflecting the poignancy of loss, and the futile effort to retrieve and retain, to freeze time and hold on to what passes. Part of Chapter’s Art in the Bar programme.